Lyft offers a new premium service through its existing mobile app. Lyft is upping its game against Uber with a premium SUV service aimed at high rollers. Starting Thursday, for roughly twice the fee, select users of Lyft's ride hailing app can request a pimped out Ford Explorer featuring a custom grille with Lyft's mustache logo in steel, illuminated entrance with LED lights, 20-inch sports wheels, leather interior and in-car Spotify playlists. It will cost US$3 per mile with a minimum fee of $10. Rich hipsters, rejoice. The service, which is called "Lyft Plus," offers "a fresh and modern transportation experience with lower prices and higher capacity than current premium options," Lyft said in its announcement. By other "options," Lyft means Uber. Uber, in addition to its black car service, offers its own higher priced SUV option. Lyft users can request one of the pimped out rides just as they would a regular car through its app. It's currently only available in San Francisco as a pilot program, but with more cities following soon, Lyft said. Users in San Francisco can request access here. 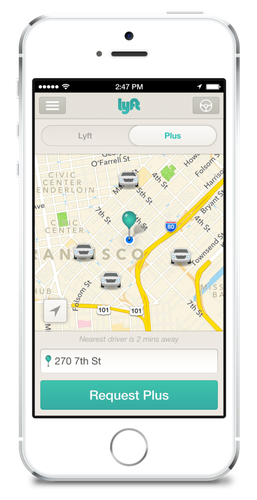 Lyft said a handful of the cars would be coming to San Francisco on Thursday, with more following later. Thousands of users have already requested access, Lyft said. Lyft partnered with the auto detailer West Coast Customs to negotiate a special price on upgrading the cars, which are owned by Lyft's drivers, a spokeswoman said. Competition between on-demand ride hailing services like Uber, Lyft and Sidecar is heating up. Uber recently said it would be offering new drivers from other companies $500 just to try out working for its platform.